A Lancashire council has bridged a gap in its finances caused by funding cuts with profits from buying a shopping centre, its deputy leader said. 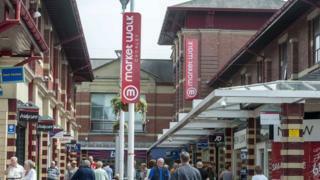 Chorley Borough Council purchased Market Walk for £23m in November 2013. The authority had estimated the annual profit to be £0.5m but it has revealed it has made a profit of £1m. Mark Perks, leader of Chorley Conservatives, who opposed the purchase, said it was still a "high-risk gamble". Despite the council's reduction of £883,000 in its central government grant, its deputy leader, Labour councillor Peter Wilson, said the income meant it has avoided having to lose services. In fact, he said it has been able to improve some, such as parks and play areas, and freeze council tax payments. Mr Wilson said there were four units empty out of the 35 units when the authority bought the shopping centre from Orchard Street Investments and now there is only one empty shop. The authority has plans to extend the car park in the Market Walk to create an additional nine retail units. Chorley Borough Council is pursuing a path which other local authorities may want to follow. The council has already been told that its grant will be reduced by 15.5% so its decision to take the plunge and buy the Market Walk now appears to be paying off. The Conservative opposition were against the idea at the time, quite ironic give that it has been a Labour administration which has gone down the enterprise route. Other councils have looked at ways of dealing with the cuts. Pendle Council, run by the Conservatives and Liberal Democrats, who took the plunge by buying the historic Brierfield Mill a few years ago, are now looking at regenerating the place, creating new homes and businesses. The authority will now get a better deal next year from the government's New Homes Bonus, an extra £250,000. Mr Perks, who is on the Market Walk steering group, said: "At the moment it is paying off but it's a big gamble as it only needs a small number of empty units for it to go wrong. "The authority borrowed £23m over 50 years which will end up costing £48m which is a big gamble." He added: "It isn't the role of a local authority to be in business in the retail industry." In July, the council announced plans to become a unitary authority. It said it has been investigating whether it was "workable" and will announce its decision in the spring.